art and life: TEA FOR TWO ?? here is how I solved the case combining Em's magnificent sketch . Punched circles, polka dots, doodling, string, text pattern, music pattern. Looking at me with your big eyes, you would say "TEA FOR TWO"? Tea parties were such fun. Chatting, laughing, and drinking our pretend drinks. Thanks for dropping by and leaving me such wonderful words to read and digest . I hope you have time to play and solve this case . Your tiny touch of blue is just perfect with your fave colours. So so perfect. Oh my goodness, just gorgeous, love the colours from the scheme and I also think the hint of blue looks lovely. Oooh!! This is just wonderful - I love the way you have used the colours and yes I echo the other comments, the touch of blue is just perfect. Love the way you have interpreted the sketch too. Off to check my stash for this week's colours and twists! But thank you for so much wonderful inspiration. Cool work again sweet photo. Wowwwwwwwwwwwwwww!! This is GORGEOUS!! I loveeeeeeeeee the colors, the layers and LOVING that banner!!!! Heather your layouts always inspire me to try CSI's challenges. This one is awesome.So much detail. Wonderful! Love how the colours in the photo echo the papers you have used, fabulous! Oh wow this is soo cute.. what a cherub! 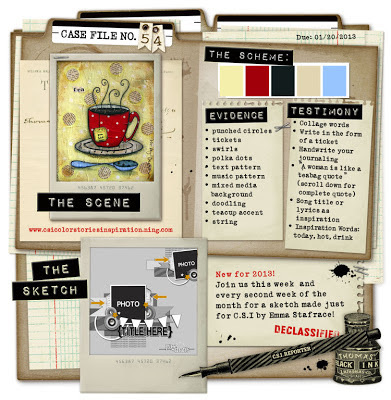 love these colors together, and your classic doodling and banners.. love this one!! I had to look very closely to find the blue but perhaps I just need new glasses! As always, the perfect photo with a beautiful layout and lovely title. This is so so so pretty!! Another fantastic composition....love everything about it! 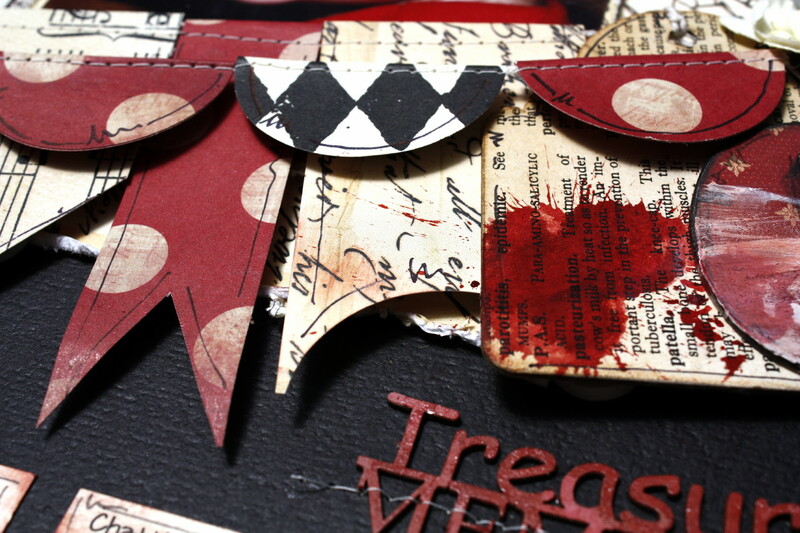 Love your stitched banners and how you did the journaling!!! This is just beautiful! Love the look of that banner! Fabulous layout! 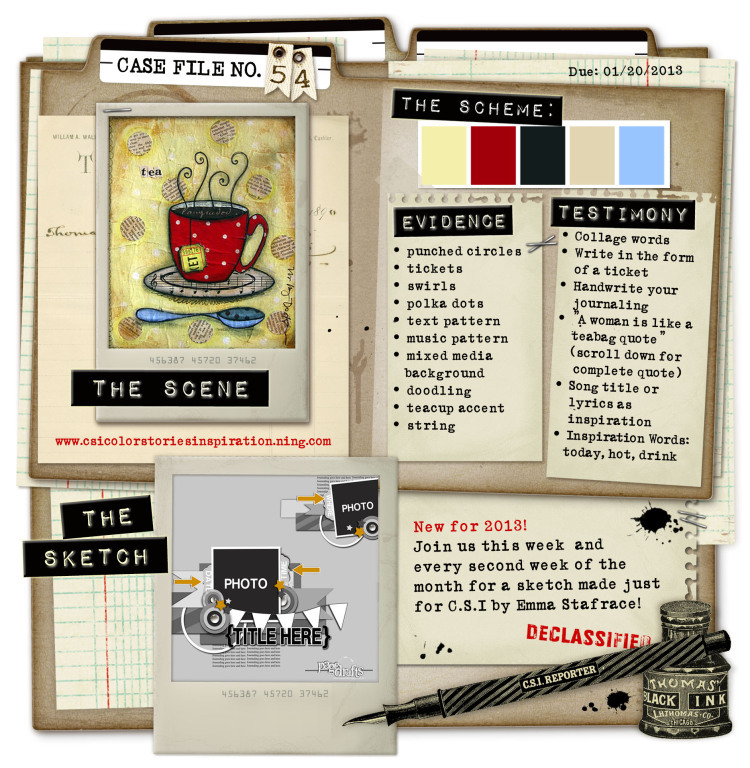 Love how you have used the colours of the case and interpreted the sketch. LOVE it!